The mothership has landed at the quintessential New England resort. At first I thought someone was taking my picture. This doesn’t happen very often, so I turned to smile. Then I heard the thunder rumble around from behind Mount Mansfield, Vermont’s highest peak. The flash, I realized, was meteorological. It was quitting time anyway, time to explore the new Spruce Peak Village Centre while we let the storm wallop Stowe with a fresh coat of white. 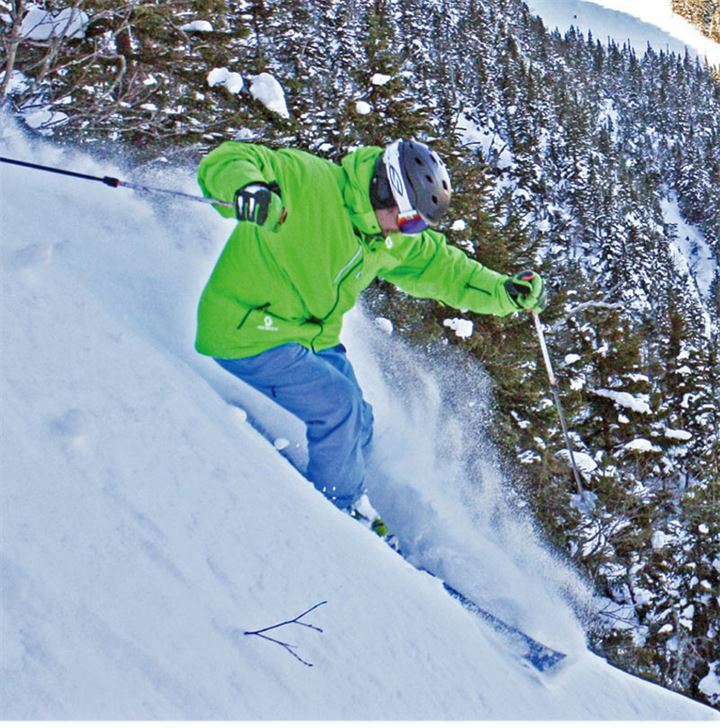 Spruce Peak Village is the showpiece of Stowe’s 15-year, US$500-million master plan that put a luxurious burnish on what is arguably the East’s most classic and storied ski resort. The plan included new lifts, more snowmaking and, not surprisingly, on-hill real estate, something Stowe had been lacking. 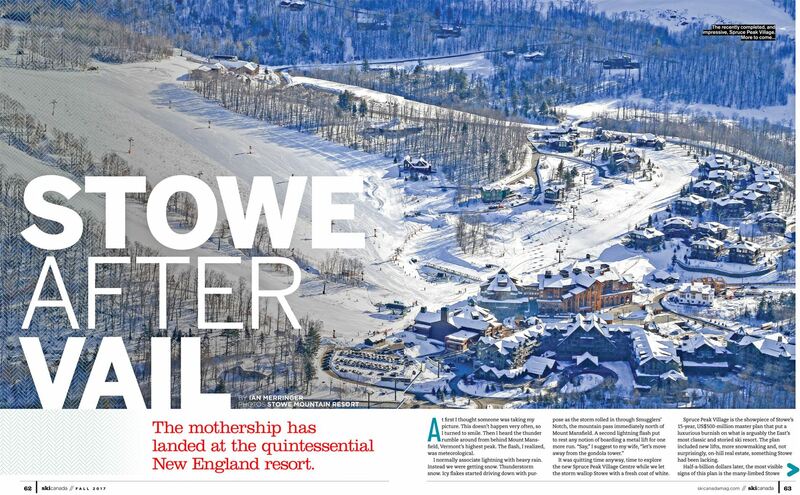 Half-a-billion dollars later, the most visible signs of this plan is the many-limbed Stowe Mountain Lodge and the handful of new buildings behind it that encircle a skating rink. 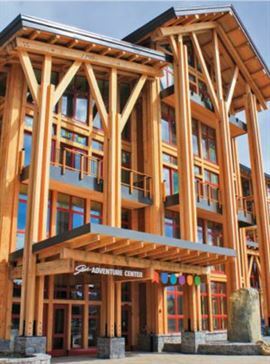 Amenities include boutique retail stores, and a three-storey indoor rock-climbing wall in the Adventure Center. Guess where we went? Upstairs in the same building that houses the climbing wall is a low-key but gleaming-new cafeteria-style restaurant called Canteen. It’s only open Thursday through Saturday, from 5:00 until 9:00 p.m., but there’s a lot of room to spread out for anyone not wanting to be hemmed into formal dining settings. Plates of pasta range from $16 to $20 and a pizza for one is yours for $25. Beyond the Canteen, dining options at the resort’s new base are on the upscale side of conventional, with more eclectic options available all the way along Mountain Road 12 km down to the village of Stowe. Most notable might be the Matterhorn, a roadhouse tavern that serves passable sushi to complement its pool tables and live music. The next morning I called ahead to the ski valet room before padding down the halls of the 312-room Stowe Mountain Lodge in my slippers. A friendly Vermonter (is there any other kind?) handed me my boots from behind a counter and told me my skis would be waiting outside. Stowe’s eight-person gondola isn’t just the quickest way up the mountain, it’s also a great way to meet people. Conversation is easier in an enclosed gondola than on a chair, where everyone faces the same direction. My first ride up had me sitting with two guys in their 60s, Jeff from Waterbury, 20 km south, and Mike from Montpelier, a further 20 km southeast. They’d been skiing Stowe for decades so I wanted to gauge the local reaction to the new digs across the road at Spruce Peak. I got a lesson in how to administer grudging approval. The next local I found to pass judgment was less sardonic. Michael Levine has lived on Mountain Road since moving to Stowe in 1972, long enough to remember the dawn of snowmaking in 1980. He’s seen Stowe change but isn’t afflicted by nostalgic sentimentality. Add to that efficient lift layout a fall line that’s not broken up with significant shelves of flat terrain and you have potential for days full of great vertical drops. The gondola runs almost 600 vertical metres in a hurry and services only great intermediate cruising terrain, with the exception of far-left Chin Clip, a run that requires a long-term emotional and physical commitment to low-angle moguls. The more famous expert terrain is found underneath the adjacent high-speed FourRunner Quad. National, Goat, Starr and Lookout have earned fame for themselves, and their mountain, for being the proving grounds of the East’s best skiers.. The 70-year-old Brown has some background on which to draw. An architectural designer by trade, he’s written the Ski Bum column in the local paper, the Stowe Reporter, for 30 years and previously wrote an arm’s-length newsletter for the resort for 18 years. He’s been a Stowe skier since 1951, but that’s not long enough to have seen major ownership changes—until this year. In June, Vail Resorts Inc. completed a US$41-million deal to buy Stowe from AIG, the insurance company heavily involved in the massive financial-industry fraud that evaporated a trillion dollars’ worth of other people’s money in 2008. Vail now owns 10 major resorts worldwide, including Whistler Blackcomb, for which it paid more than a billion dollars in 2016. I checked in with Brown after the Stowe deal was announced, to see what the local reaction was. Incoming Vice-President and General Manager Bobby Murphy has announced single day tickets will increase six per cent to roughly US$130 (or about C$160), but locals are understandably thrilled to see the arrival of Vail’s universal Epic Pass, which will reduce their season-pass price to US$879 from a previous high of $1,600. Again, Brown reports a fear that the lift lines on sunny weekends will be swamped with New Yorkers who all of a sudden find it economical to buy an Epic Pass, but he sees the same corporate heft of Vail that allows it to sell the passes across its resorts as being a good thing for the long-term health of his mountain. “AIG didn’t want to be in the ski business anymore,” says Brown. 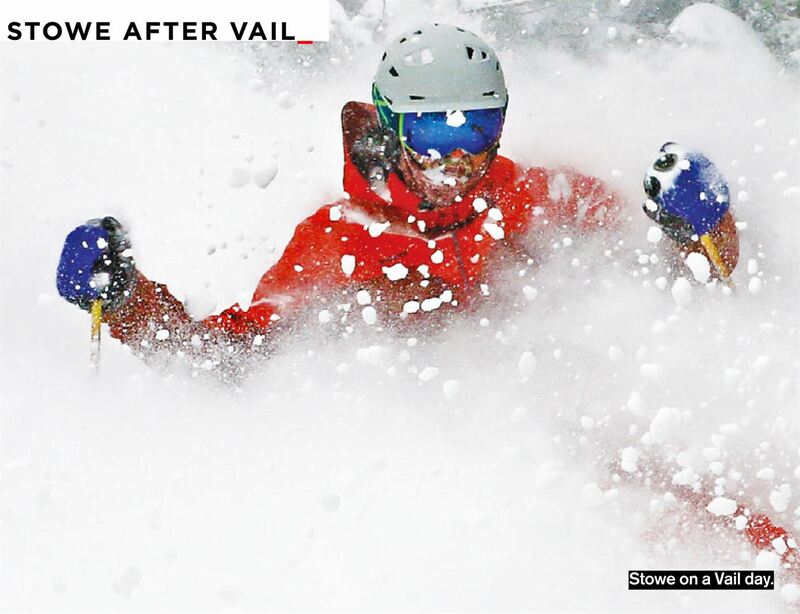 “Maybe Vail will broaden the mountain’s ability to cater to more skiers, by bringing in more terrain, even more lifts. From a corporate standpoint, that’s what they do. Toronto skiers can get to Vermont quicker than their car-bound cousins can get to Collingwood. From the downtown Billy Bishop Airport, flight time to Burlington is an hour and twenty minutes, with Stowe being a scenic 45-minute drive from town. Burlington’s airport, with its yoga room and rows of rocking chairs, meshes well with Porter’s mission to civilize air travel. The airport has even opened up its old air traffic control tower to the public so you can watch the planes come and go, complete with radio communication (just try to resist acting out the scene from Airplane: “We have clearance, Clarence. Roger, Roger. What’s our vector, Victor?”). Halfway between the town of Stowe and the ski area that borrows its name is a resort with a famous name that’s all its own. At the Trapp Family Lodge, the hills are alive with the swishing sound of cross-country skis. The Trapp family, of Sound of Music fame, settled in Vermont after the Second World War and took to farming between stints on musical tours. By the late 1960s, the family was cutting trails for the first cross-country ski centre in New England. It’s grown into a sprawling resort, complete with white-tablecloth dining, indoor pool, outdoor hot tub, climbing wall, spa and, new last year, a ski-in, ski-out Bierhall brewery and restaurant. For lunch or dinner (or both), you can ski or drive to sample the eight varieties brewed on-site over plates of sausages, sliders and more. The Trapp Family Lodge is a first-class operation, but well-practiced hospitality aside, its current claim to fame is its 100-km network of machine-groomed Nordic trails spread over 1,000 hectares of wooded hillsides. Consider a change of scenery and pace from Stowe’s alpine turning by visiting the Trapp Family Lodge for Nordic gliding or backcountry touring. 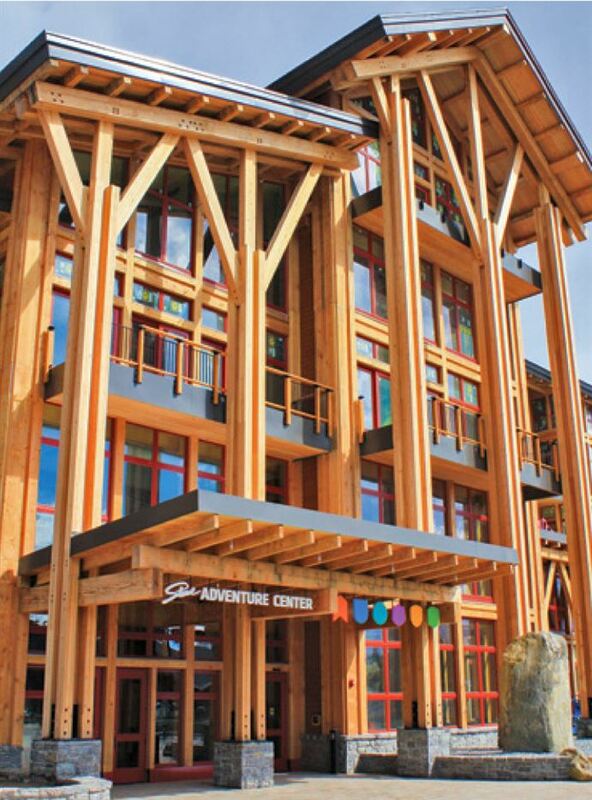 The resort’s rental inventory includes Nordic touring and AT gear. Properly equipped, backcountry aspirants can use the trail network to skin up and gain elevation to areas well suited to gliding back down through the lightly gladed forest. The day I tried it, the early-season snow was soft but not deep underfoot as I descended through the spaced-out hardwoods. It’s a pick-your-pitch scenario, but the terrain never gets too steep. Relaxed route-finding is the order of the day here. Whatever route you choose, it will lead back onto a cross-country trail. Stay on the frontside for shorter and flatter pitches. Head all the way up and over the summit at Round Top (for a vertical gain of 330 metres above the base lodge) and you can find steeper, longer lines down to Haul Road which, happily enough, will loop you back around toward the Bierhall, where you can cheer a lusty Prost! to being a Vermont backcountry skier.